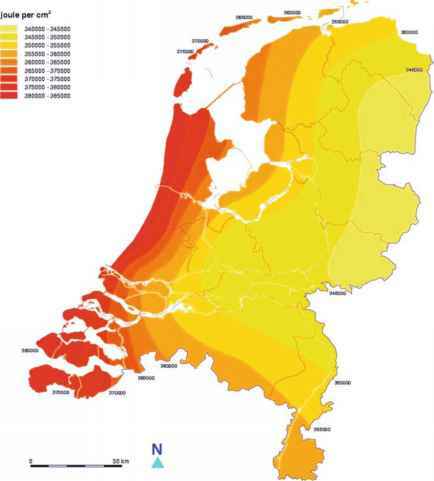 Figure 4.36 Contours of HOBr abundance (pptv) for December. Values are from the Goddard two-dimensional climatological circulation model , Based on a model ran to the steady state using CFC and halon emission levels for 1990.
upper stratosphere, the abundance of HOBr decreases as partitioning of the Br, family shifts toward Br,. In the lower-stratospheric polar night region (high northern latitudes in Figs 4.34-4.36), the partitioning of Brv is in a unique state. Because photolysis rates are approximately zero, the reaction between BrO and N02 rapidly depletes Brr by converting it to Br0N02 (reaction (4.43)). The BrONO, is subsequently converted to HOBr in a time-scale of a few hours through hydrolysis on aerosol surfaces (reaction (4.87)). When exposed to temperatures below about 210 K (common in the lower-stratospheric wintertime polar regions), the reaction converts all of the HOBr into BrCl in a few days or less. The net result is that the vast majority of Brv in the lower stratosphere polar night region is in the form of BrCl. Figure 4.37 shows typical diurnal cycles for the members of Brv at mid-latitudes. Br, declines after sunset, and is zero for most of the night throughout the stratosphere. At sunrise, destruction of BrONO, through photolysis leads to a rapid decline in Br0N02 and a concomitant increase in Br,. Much like HOC1, HOBr shows little diurnal variation despite its relatively short photochemical lifetime. BrCl is important in the upper stratosphere, where significant abundances of CIO and BrO survive well after sunset, leading to a buildup of BrCl. 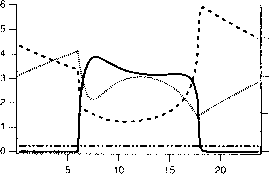 Figure 4.37 Diurnal cycle of the primary components of Br, derived from a model incorporating the reaction set of JPL 94 |91 J. The model run is at 45°N on March 21, 1996 and using background aerosol abundances; "upper stratosphere" is from the 3.16 hPa level of the model, "mid stratosphere" is 14.7 hPa, and "lower stratosphere" is 57.0 hPa. The BrCI trace is only shown on the upper-stratosphere panel. 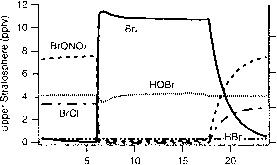 In the lower stratosphere, the hydrolysis of BrONO, (reaction (4.87)) causes the abundance of BrONO, to decrease and HOBr to increase throughout the night (bottom panel of Figure 4.37). As a result, HOBr is an important Brv night-time reservoir, especially at high aerosol loading, such as after a volcanic eruption. At sunrise, the rapid photolysis of HOBr leads to a burst of HO, |74,115J. A comparison between the diurnal cycles in Figure 4.37 and the Clv cycles plotted in Figure 4.12 shows important differences between these two families. Most importantly, the fraction of the Br, family in the form of the O,-destroying BrO radical (which is the rate-limiting reactant of the bromine catalytic cycles) is -40-50% throughout the stratosphere. In contrast, only a few percent of Cls is in the form of CIO in the lower stratosphere, rising to ~ 10-20% in the upper stratosphere. In addition, the rate constant for the reaction between BrO and HO,, which rate limits the most important O,-destroying bromine catalytic cycle, is five to six times greater under stratospheric conditions than the rate constant for the reaction between CIO and HO,, the rate-limiting step of the comparable chlorine catalytic cycle. As a result, on a per mole basis, bromine atoms released into the stratosphere are 40-50 times more effective at destroying Ot than chlorine atoms [ 13,135,136]. This suggests that despite the small abundance of Brv (-15-20 pptv), it can still be an important catalyst for O, loss. There are no loss processes for the Br, family. Instead, the concentration of Bry in an air parcel increases until all of the bromine-bearing organic molecules have been destroyed. As their name implies, CFCs generally contain fluorine atoms in addition to the chlorine atoms discussed earlier. Thus, the transport of CFCs into the stratosphere followed by their breakdown serves as a source of F atoms for the stratosphere [ 137J. The abundance of tropospheric fluorine bound in stable organic molecules—and therefore bound for the stratosphere—was 1.82 ppbv in September 1993 1138J. By analogy to CI, and Brv, we can define the odd fluorine family, Fv, to be the sum of the abundances of HF and other F species such as FONO„ HOF, FO, and F. Further, we expect the FO radical to rate limit catalytic cycles that destroy O,. HC1 and HBr). In fact, the HF molecule is not photolyzed or oxidized in the stratosphere, and can therefore be considered chemically inert. As a result of this, virtually all Fv is in the form of HF, and very little is in the form of FO. This can be contrasted to the chlorine and bromine families, in which a few percent and a few tens of percent of CI, and Brv, respectively, are in the form of active O,-destroying radicals. Because of this, fluorine is not expected to contribute to O, loss in the stratosphere. 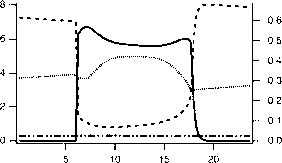 Figure 4.38 shows vertical profiles of HF, the major F, reservoir molecule in the stratosphere. Also shown are profiles of COF, and COFCT, two species that are formed from partially decomposed CFCs created during the oxidation of the CFCs. About 70-80% of stratospheric fluorine not attached to an intact CFC is in the form of HF, with the remainder in COF, and COFCT. While fluorine chemistry is unimportant in the stratosphere, the inertness of HF makes it useful as a tracer of atmospheric motion [ 1391. As with the other halogen families, CI, and Br„ there are no loss processes for inorganic fluorine. Instead, the concentration of HF in an air parcel increases until all of the fluorine-bearing organic molecules have been destroyed.